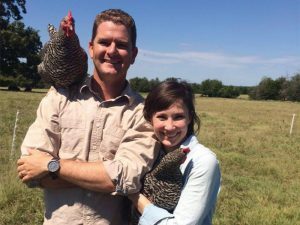 “Some folks must question why I went to Austin College to become a farmer,” said Thomas Locke ’04. “But really, Austin College helped lay the foundation that allowed me to identify what I needed to do in the world, and go do it. 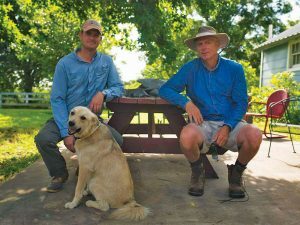 I will forever be grateful for that time in my life.” Eleven years after graduating from Austin College, Thomas is working as an organic farmer on his family’s farm in Allens Chapel (a short car trip from campus). 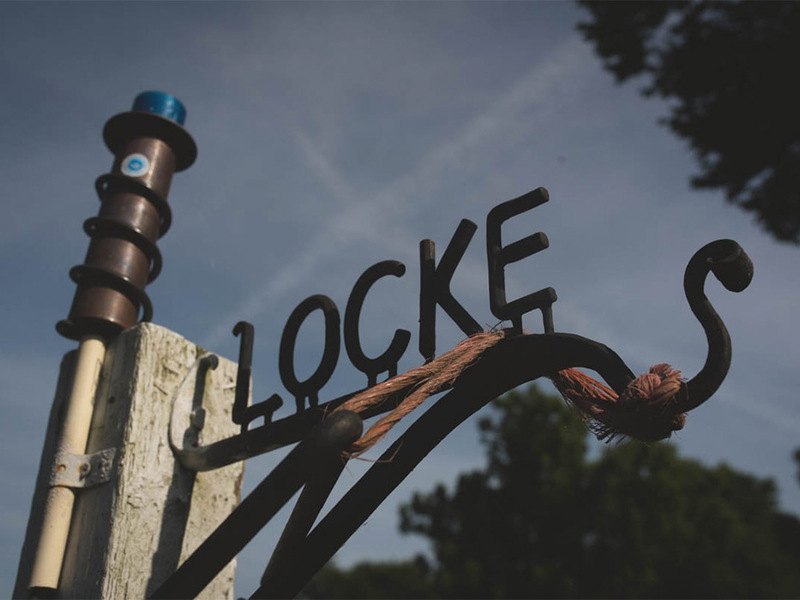 His livestock operation, Bois d’Arc Meat Co., includes turkeys, chickens, pigs, and cattle, all raised entirely on pasture. He sells to faculty and staff at Austin College in addition to friends, family, and neighbors, and as of 2016, he will be a regular vendor at the newly renovated Dallas Farmers Market. With a lopsided grin, Thomas admitted that he hadn’t always dreamed of working as a farmer. He loved spending holidays at the farm that has been in his family since the 1850s, but he thought he’d be a white-collar employee somewhere. Gillian and Thomas married in 2011, just before Gillian earned a graduate degree in public policy from Duke University. At the time, Thomas was working at Carolina Farm Stewardship Association (CFSA) where he helped farmers make the transition to organic. Not long after they were married, Thomas shared with Gillian his desire to move back to Texas and work on the farm. He realized that he loved the work he was doing at CFSA, but he wanted not just to help farmers make the move to organic but to actually be a practitioner of a sustainable livestock operation. The news came as quite a surprise to Gillian, but she “thought back to the growers she interviewed for her honors thesis, and what full lives they led.” So, Thomas moved back to Texas in August 2014 to expand the family farm into the Bois d’Arc Meat Company. He found a house to purchase in McKinney and created a partnership with his uncle, Gordon Locke, who lives at the farm. Gillian joined Thomas in Texas a few months later and recently transitioned to a new position in Dallas at Communities Foundation of Texas. She still draws on her research from her Austin College days in conversations with Thomas about the farm, and Thomas and Gordon are preparing for the expansion of their customer base and the farm business as a whole. To learn more about Bois d’Arc Meat Company, connect through its Facebook page and visit them at the Dallas Farmers Market. Thomas ’04 and Gillian Grissom Locke ’07—along with Thomas’ Uncle Gordon—operate a sustainable, pastured livestock operation in Allens Chapel (near Windom). 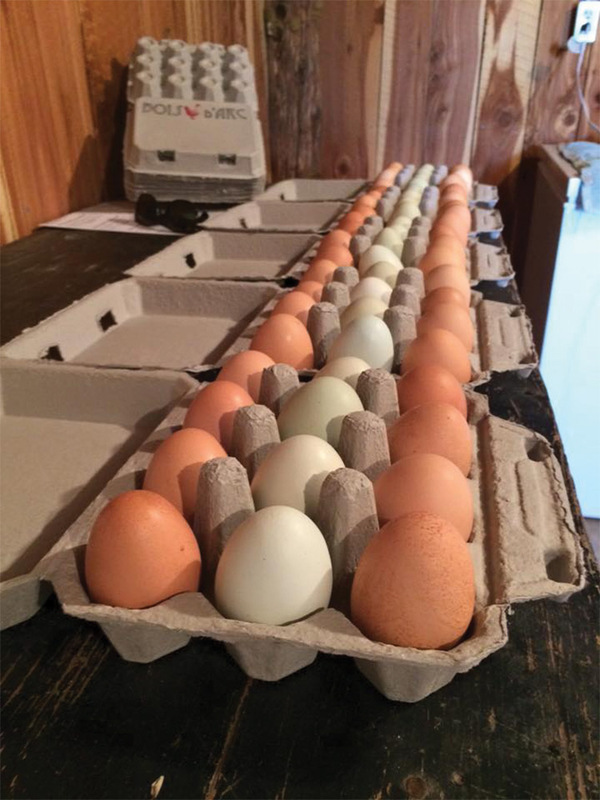 The farm has been in the family since 1850; they now raise cattle, heritage pigs, chickens, and turkeys, all pasture-raised and organic. The Lockes sell their products as Bois d’Arc Meat Co.